There were times when this week of not-teaching felt too long, when I found myself wanting to be busy and hectic like the weeks have so often been. I think part of it is because there's so little time left until the holiday break, and I know that once school kicks into high gear, the next two weeks are going to fly by awfully quickly. And we can be honest here: I'm really, really excited to go home. But it's not as if this place isn't full of amazing opportunities and adventures, and the last few days have not included a minute of that laziness that I felt during exams. So here's a recap of the weekend. With finals behind us and a whole weekend ahead, we began with a big long Professional Development session at which King's welcomed Michael Nachbar, the director of Global Online Academy. This is a pretty amazing project that's brought together some of the best prep schools in the world to create online classrooms in which students can take courses offered by teachers from around the world. Lina, my Arabic teacher and Downton Abbey watching partner (we started last week and are already on season 2), teaches an Arabic class for GOA, and it seems like a ton of work but an amazing chance to connect students from wildly different places and cultural backgrounds. So his talk was cool, but even cooler were the discussions we had afterwards about how we can do a better job implementing technology into our classes and the structure of the school. We broke into little groups and the 5 people I was with were just offering such thoughtful, creative, insightful ideas about things that King's could be doing better and how we could improve. It brought on this difficult and powerful feeling of responsibility, like picking up your pack for the first time when you're about to go on a long hiking trip. I felt that day like there was a huge weight on my shoulders, but not an entirely unwelcome one. This profession is just so full of people who want to do the best they can for the betterment of others, and watching that spirit in action is something that honestly gets lost in the day-to-day slog of planning and grading and supervising. Those kind of days make me really glad I'm teaching, at the same time as they make me feel like this job is ridiculous and impossible. I think we need to have PD discussions more often. My contribution, with the help of Yasmine the Human Sifter, was the old family gingerbread recipe, and I have to say, we did a bang-up job. 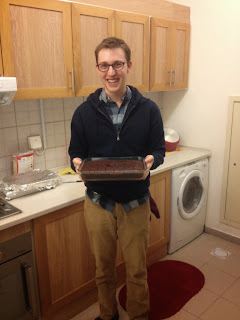 We made two loaves (or whatever you call them), and the second didn't even get touched because there were so many desserts, so I have a full pan of gingerbread sitting on my kitchen counter. I'm looking at it right now, there under that tin foil, calling my name. I haven't even had the power to eat it though, because here's the thing: Thanksgiving potlucks where 60 people bring dishes are RIDICULOUS. There were five tables of food: a greens and salads table, a sides table, a turkey table (the turkey was provided by the school), a bread/more sides table, and a dessert table. I filled up my plate, then went back for seconds, then had dessert which included I think seven pieces of gingerbread. It was absolutely incredible. 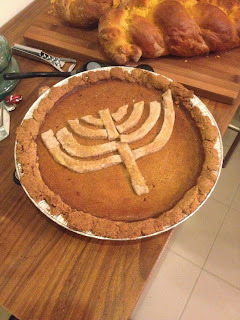 Highlights included: sweet potato casserole, mashed potatoes, a beet and goat cheese salad, pumpkin pie cheesecake, apple pie made with tea-soaked apples, and stuffing and rice and beans and cranberry relish and peppermint cake and molasses cookies and challah (!) and basically everything imaginable. I ate all of it and was so full and it was so worth it, and then we had mulled wine at Meredith's which was also worth it. One of my favorite Thanksgiving meals, to be quite honest, and with great company and much merriment. So I went to sleep incredibly full, knowing that I had fewer than 24 hours to regain my appetite for what was to come. Yes, the weekend of eating did not stop at Thanksgiving. We had bigger fish to fry. Or, as Tricia called it the night before, "Chthanksgiving," which is one of the funniest things I've ever heard and one of the most successful stories I've ever retold. People collapsed. It was really funny. THIS was the real triumph of the weekend. A much smaller group of us had been planning for a few weeks, and we spent the day cooking before gathering for a nine-person meal that brought the two holidays together like the asteroid smashing into the earth and killing the dinosaurs. I know I said I wouldn't do too many food blog posts, but this was maybe the most impressive culinary event I've ever been a part of. Take a look. 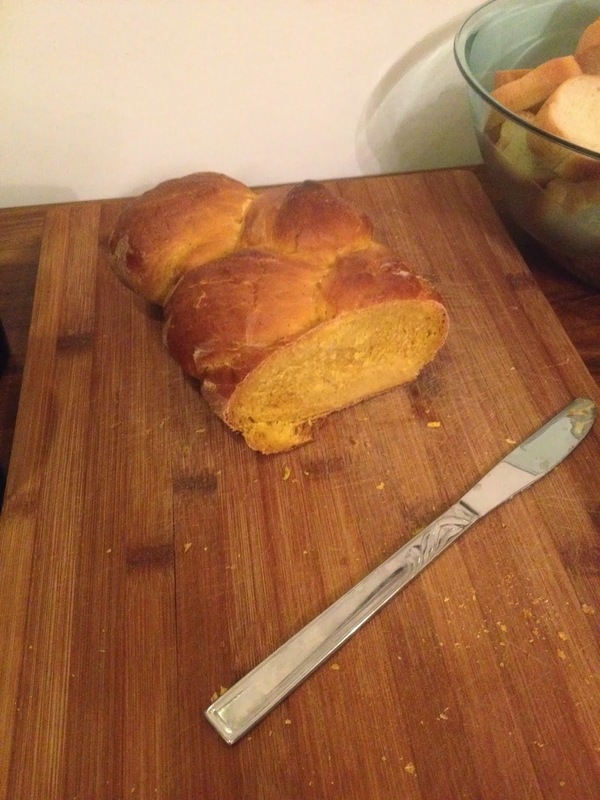 The night began with Maria's pumpkin challah, which tasted basically like regular challah, but had an incredible rich consistency and a deep orange color. It didn't hurt that we served it with some kind of ridiculous cinnamon honey butter. The table, prepped with the chanukiah, and four dishes: stuffing (not Chanukah-themed but delicious); roasted cauliflower; marinated vegetables, and Cassie's and my greatest creation. A close-up of said creation: sweet potato bourbon kugel. 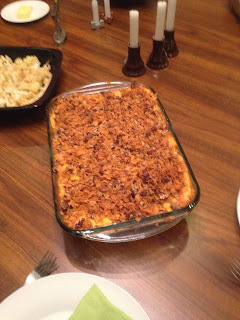 A kugel, yes, but with a Jack Daniels-infused sweet potato puree mixed in with the cheese and noodles, and a cornflake-pecan-brown butter crust on top. This thing was UNREAL. 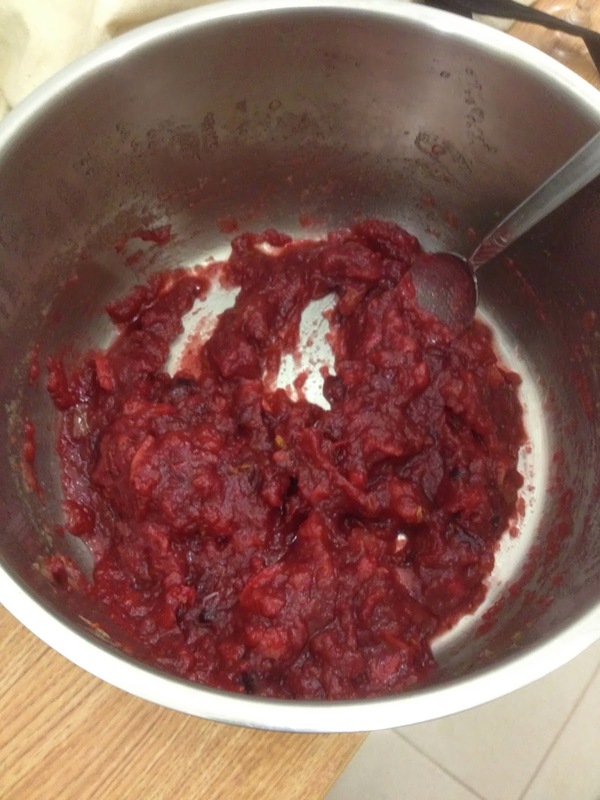 I kind of want it to be a Thanksgiving staple for the rest of my life. The festive table, with Chanukah and Shabbat candles lit (I led everyone in prayers). 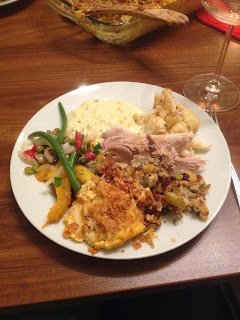 Featured here are the turkey, which was delicious, and in the lower left, horseradish-chive mashed potatoes. Like I said, we just smashed some holidays together. Thanks, Buzzfeed. My plate. Turkey, stuffing, kugel, potatoes, cauliflower, the marinated vegetables, and Jamie's roasted squash with tahini-lemon dressing which was also incredible. I had at least two more helpings of kugel after this. There was a brief break after dinner for a Yankee Swap (we had considered a Secret Santakkah, but decided on a Yankee Swappakah instead). Little gifts made the rounds, I got a fantastic cocktail shaker, and then it was time for dessert. And the real winner of the evening, also Maria's, were the pecan pie rugelach. 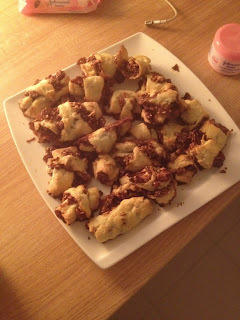 Literally rugelach with pecan pie filling instead of jelly or chocolate or whatever. I think I had a thousand. The presence of whiskey whipped cream helped. These were perfect. I vow that I will someday eat them again. This, too, should be a keeper, Thanksgivukkah or not. Just delicious. It was truly a historic weekend of food and I am still recovering, but blissfully so. Today we all began the painful process of returning to reality: finalizing grades and writing comments, cleaning up classrooms and writing lesson plans, and in just over an hour, it'll be time for an epically long Glee Club rehearsal to prepare for tomorrow's concert with the orchestra (it's a benefit for the Philippines, which is pretty cool I think). Then it's off to the races, with twelve days to go until winter break, and America. As I pulled down a few of the term 1 decorations in my class to get ready for tomorrow's "first day of school," I was struck with just a tinge of nostalgia. With grades in, and classrooms reset, it really does feel like I'm done with that first group of students, and now I'm about to jump into something brand new all over again. Just when I started getting comfortable, too. We'll see how it feels to start working some philosophy magic on a new bunch of kids, and with three weeks of vacation around the corner, I hear it's hard to get anybody to sit still. I'm awfully glad to have had this weekend to come together and share food and drink and fun with everyone, and I'm ready to get the show on the road. Let's do it, December.